Today's post is about time management. We have so much going on in our lives with work, school, kids, etc. 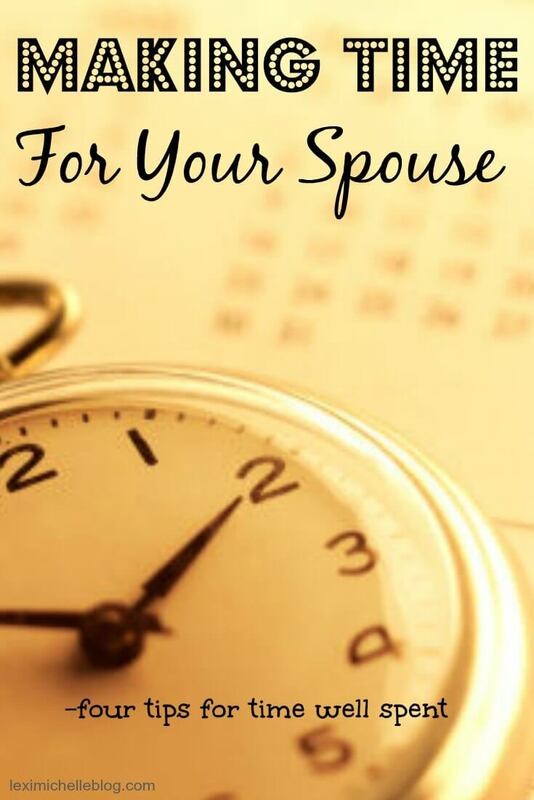 it can be really hard to make time for our spouse. Here are 4 tips I have for making the most of your time together. Prioritize: There are certain things that must get done everyday. Make a list and communicate it with your spouse so they know where your attention will be and why. Schedule meals: Having a set time for breakfast, lunch, or dinner everyday where you put everything else aside and just eat, converse, and spend quality time with your spouse is a much needed break during a hectic day. Cultivate a peaceful environment at home: make sure home is a place you both want to come home to. Greet each other in a loving way and try not to add any stress to your lives with criticism (or rude remarks about what tasks weren't accomplished [i.e. house not clean, dinner not made, spouse is late, etc.]). Set up alone time: Set time aside at the end of each day to be together. Whether that time is spent watching TV or talking, just relax and enjoy each other's company.